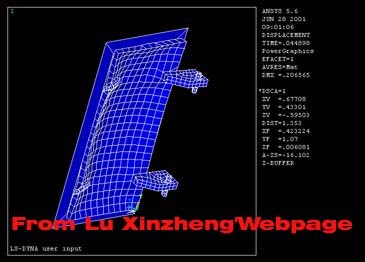 Dynamic finite element simulation of blast-resistant doors under explosion load. Abstract: Simulation for blast-resistant doors under explosion load is processed in this paper with the dynamic finite element software of LS-DYNA. With proper material constitution relationship, the numerical results show the elastic-plastic deformation of the doors. With the special contact ability of LS-DYNA, the numerical simulations show the contact relationship between the door and the frame, the door blot and bearing, respectively. 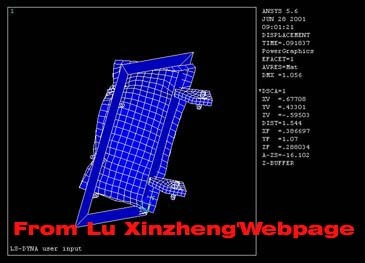 The damage process of the doors is obtained from the numerical results and the week points of the door in different time points are shown clearly. By changing the load-time curve of the explosion, the safety of the blast-resistant doors is discussed in detail. Keywords: Blast-resistant door, dynamic finite element, contact analysis.